On June 26, 1959, the St. Lawrence Seaway opened. The series of canals and locks opened the Great Lakes to ocean-going vessels. 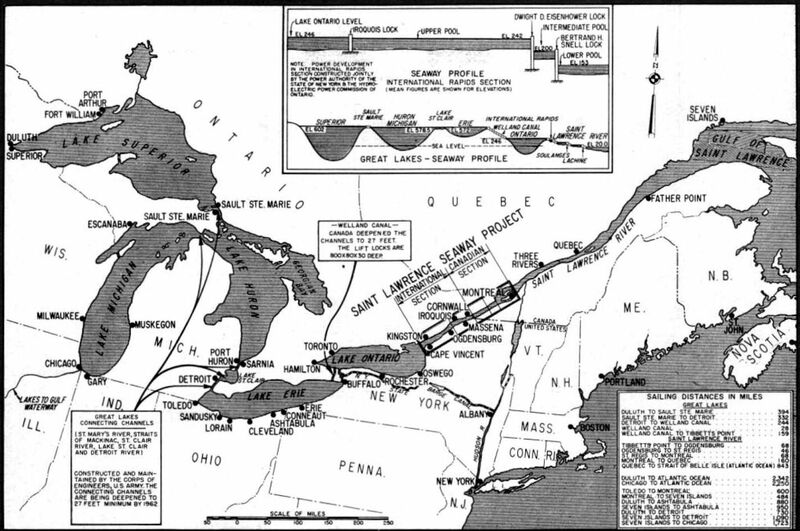 The St. Lawrence Seaway—completed the same year as this map of the project, 1959—is jointly managed by Canada and the U.S. It is a series of canals and locks that opens the Great Lakes to ocean-going vessels. On June 26, 1959, the St. Lawrence Seaway officially opened with a ceremony in St. Lambert, Quebec, Canada, attended by Queen Elizabeth II and U.S. President Dwight D. Eisenhower. The St. Lawrence Seaway opened the Great Lakes to ocean-going traffic. The St. Lawrence Seaway, named for the river that flows from Lake Ontario to the Atlantic Ocean, was a joint U.S.-Canadian effort. It stretches nearly 4,025 kilometers (2,500 miles), from the Atlantic Ocean to the port of Duluth, Minnesota, on the western shore of Lake Superior. The seaway is not a single unified route, but a series of canals, locks, and dredged waterways. More than 40 million tons of cargo pass through the St. Lawrence Seaway every year. About half of that traffic is from international sources, mostly Europe and the Middle East. The other half is trade between U.S. and Canadian ports. structure on a waterway where gates at each end allow the water level to raise and lower as they are opened and closed.